Chase Heard and Andy Stepanian are not really related by blood but they bonded over many interests like creating timeless clothing designs. Their brand, Howler Brothers, produces functional and fashionable clothing items and accessories. They are inspired by comfortable outdoor apparel and classic Western wear. Today, we’re talking about the Spring 2017 collection, packed with technical features perfect for enjoying the great outdoors. H Bar B Tech Shirts represent the classic functional Western-style the company aims for. The idea was to design a comfortable shirt that will serve its purpose but also perform when it comes to different elements. It’s crafted out of a poly/cotton blend with engineered stretch. This material dries quickly and is breathable, making it perfect for spring rains. It’s wrinkle resistant meaning you don’t have to worry how you pack it. Additional useful features include a hidden zipped pocket, vented rear yoke, ring snaps, and the super cool sunglasses-cleaning microfiber-lined hem. Shirts come in several patterns and since they have a regular fit, you’ll easily get your size. 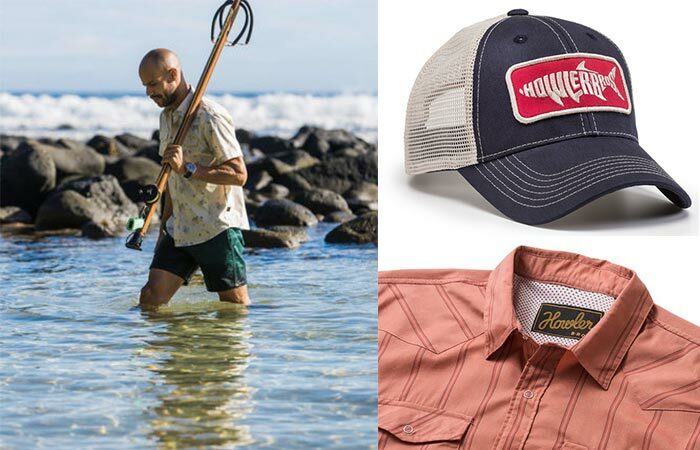 Howler Brothers Spring 2017 Collection features easy to wear, comfortable and quick-drying items made from breathable and long lasting materials. Also in the Howler Brothers Spring 2017 Collection is the Horizon Hybrid Short. It was influenced by waves, water, geography, fashion, and art and comes in a nylon ripstop material, also quick drying. With the structured fit, you’ll feel very comfortable, no matter the occasion. The shorts feature a button closure with zipper fly, nylon mesh pocket bags and two back pockets. Just like the shirts, they are available in several colors that go along with the rest of the collection. Speaking of the rest of the collection, we can’t forget the Silver King Standard Hat. It has an adjustable hook and loop closure, it’s not too high and not too low.